It’s that time of year. The roads are all being repaved. Storefronts are being remodeled. Power lines are being mended. Plumbing pipes are being laid. Everything seems to be functioning in a semi-normal kind of way for once. Why, you might ask? It’s election time. Time to follow through on those campaign promises so that you actually have something to put on your flyers and posters this time around. Got to show the people that your government can actually make the changes it promised…four years ago. Too little too late? Naahh. So at least for the meantime, things in Albania are functioning like they should. The blessing in disguise that is the election cycle. I’m not sure if its a blessing or a curse to be in Shkdoer to witness the chaos of an election in Albania, but as a former poli sci student it has really opened my eyes and blown my mind to watch developing world politics and democracy in action. There are definitely some commonalities between American democracy and Albanian democracy (and not always in a good way). Every 4 years we vote for a new leader. In the U.S. we vote for the president directly but in Albania they vote for the governing party which then selects their own prime minister. And since the fall of communism, this country has been locked in a political brawl between the Democratic Party and Socialist Party. And ironically enough, the same two men have been vying for office. Yup, that’s right. Ain’t no such thing as term limits in this place. Makes me love the founding fathers that much more, if not just for the sake of staring a new person’s face on all the posters and signs come election time. So for those of you who don’t follow Albanian politics religiously (which the domino-playing grandpas in my town would find incomprehensible, mind you) let me fill you in a little. On the “right” we have Sali Berisha, the current Prime Minister and leader of the Democratic Party. He’s been in power for the last 8 years. But that’s not it. He was also the personal doctor to the communist dictator Enver Hoxha all those years ago. And he was the man in charge when Albania fell into turmoil in 1997 during the collapse of the the pyramid schemes (he even went so far as to make announcements to the people that they could trust the schemes and should invest all their money. Oops). But don’t worry, Albanians either are the most forgiving people ever or they all have short term memory loss. Sometimes I just smile as I think about what Fox News would do to this guy if he tried to run for office in America. On the “left” we have Edi Rama who has been fighting for his turn at the reigns ever since Berisha was elected. These two are long time political rivals. Only poor little Edi never seems to win. With rumors floating around that he is drug-running gangster who rapes his girlfriend and leaves her out naked in the middle of the street, I wonder why. And I also wonder where they people get their facts from?! Seriously. But without the means to verify or deny anything that the media spins, what can you do. Unfortunately, it’s not all that different from the ridiculously wild accusations that are debated on national television in the U.S. either. So who would you vote for? And does it even matter? I’ve asked so many Albanians what they think will happen after the election and the most common response is this: nothing. What?! After all this, nothing will change?! Nope. So many people here think that Edi Rama and Sali Berisha are too sides of the same coin. The corruption and lack of rule of law in the country make it very different to enact real change. So what’s going to happen after D-Day on June 23rd? Well first of all it will take up to 2 months for the results to come in. That’s right. None of this late night watch parties and final countdowns or predictions after the polls are closed. Then when everything is settled (and of course assuming there are no protests or riots over the results) the new party will take control. If we DO in fact have a change of party, then all the current government employees will lose their jobs. You guessed it. 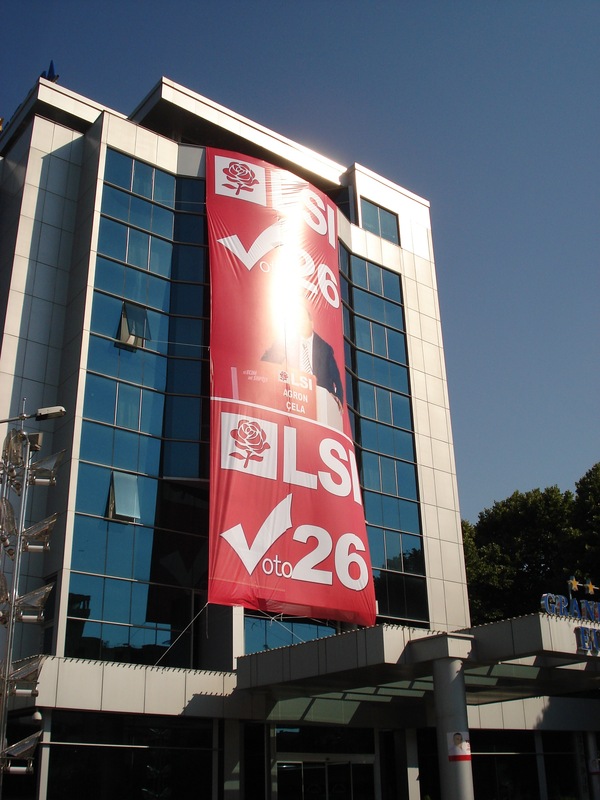 Almost every single job in Albania is a political appointment. From principals of schools to judges, doctors, economists, teachers and everything in between. Trash it all and start a new. And not necessarily based on who deserves the job. If you have the right last name, the biggest paycheck, or the right connections then you get the job. The other big change after election day is that all of the sudden half the population is insanely wealthier than before. Yup. Vote buying. And not so subtle either. I’ve seen people walk up to teachers after school and ask them “how much for your vote”. 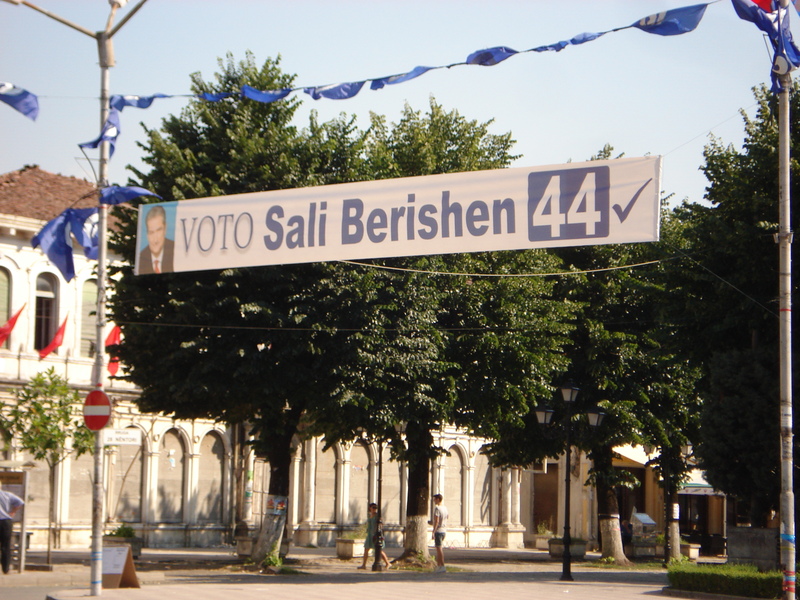 The last election four years ago was won by Sali Berisha with a difference of just 82 votes so this is no joke. All those people who are sick of their low income job just have to go to their local party office and sign on the doted line. The parties will readily buy your vote for upwards of $1,000 and more if you can get your friends on board too (mind you the average salary here is equivalent of $300 a month so just imagine how much this money means to people here). Then after you vote you just have to come back with a picture of your ballot showing who you voted for and the money is yours. One day you’re fixing bikes for 20 cents a pop, the next you’re the new regional director of the national internet company. And all the big time supporters of the winning party, those who donated company vehicles and hotel rooms and free restaurant dinners, will end up with big fat paychecks too. Not that I think America is the wonderfully non-corrupt place where elections are free and fair and unbiased without a question of a doubt, at least we do our corruption and bribing and deals behind closed doors. But I do have to commend my wonderful city on their attitude to elections this time around. For once, there is actually a real choice. 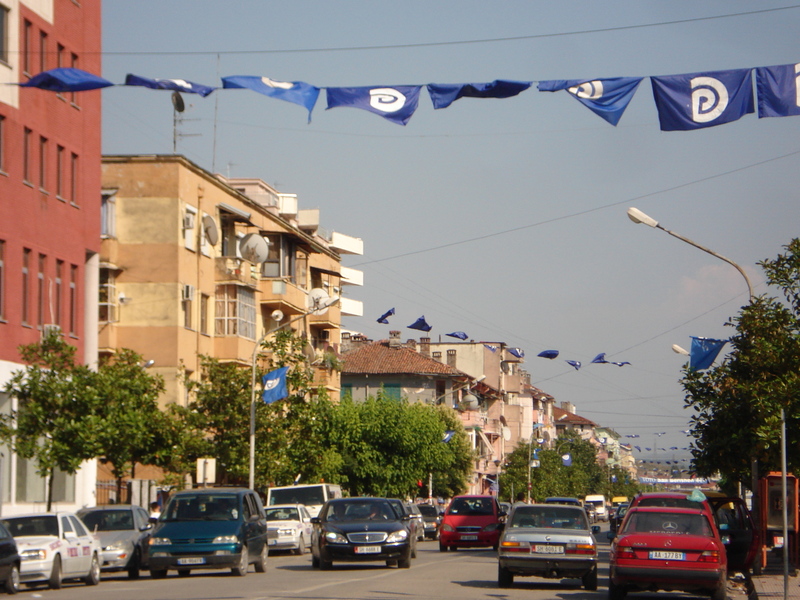 Shkoder has long been the Democratic Party’s stronghold with almost 100% of the population voting Democratic. And not necessarily because they even like or support the democratic party. But rather, because they have to. 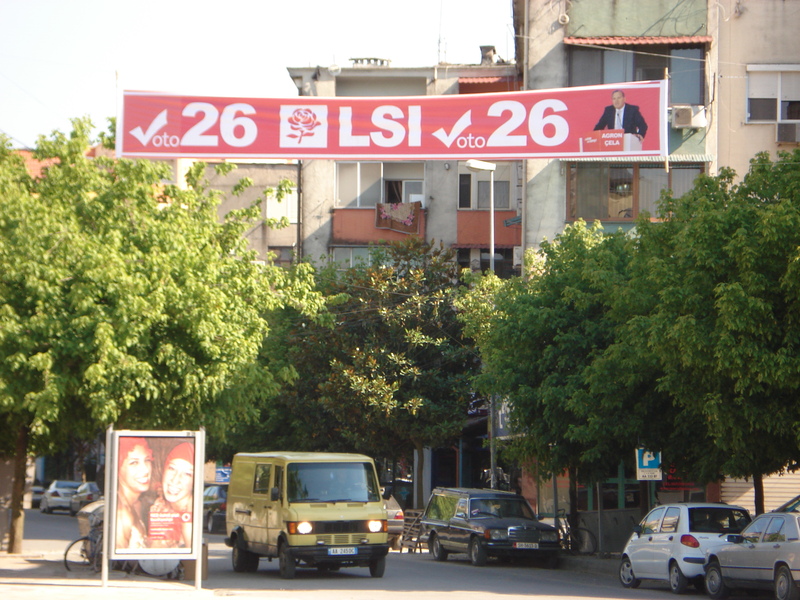 About 15 years ago Shkoder voted against the Democratic Party for the first time and after the election the Prime Minister shut off the power to the city. And kept it off for 3 years. That’s right. Wouldn’t you think twice about voting against the government the next time around? 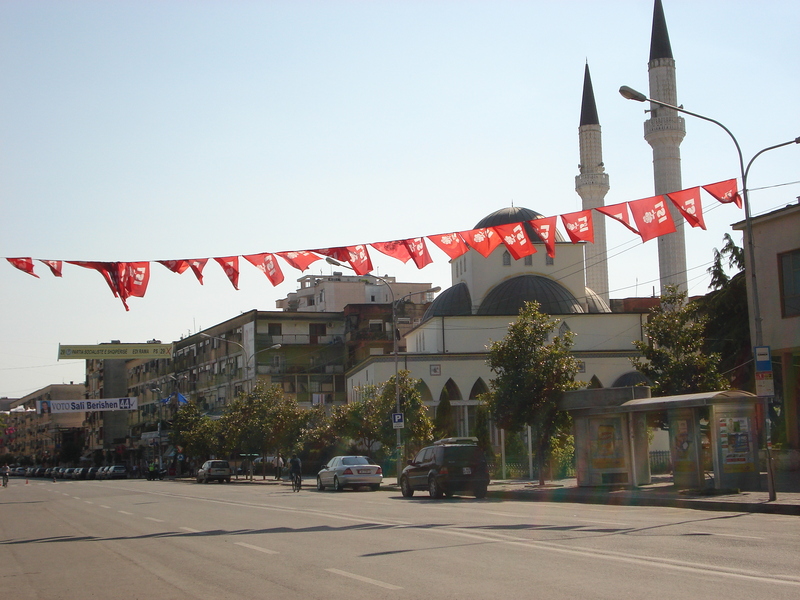 But this year, about half of Shkoder is supporting the Socialist Party. Openly and proudly. I personally have no preference over which party wins (since they seem the same to me), I’m just glad that people finally feel like they have the right to choose and vote fot their government. This is a democracy after all.